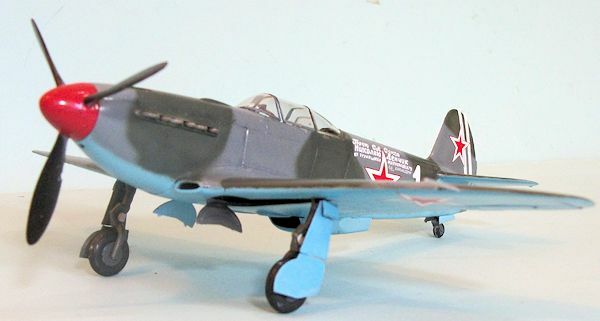 The Yakovlev Yak‑3 is commonly considered the best sub-type of the wartime Yakovlev fighter series that began with the Yak-1. The Yak-3 was one of the smallest and lightest major combat fighters fielded by any combatant; its high power‑to‑weight ratio gave it excellent performance. Top-scoring French ace of World War II Marcel Albert, who flew the type with the Normandie‑Niémen Group, considered it aircraft to the P‑51D Mustang and the Supermarine Spitfire in aerial combat. The Yak-3s origins go back to 1941, when the I‑30 was offered with the I‑26 as an alternative to the Yak‑1. The I‑30 was powered by a Klimov M‑105P engine and construction was all metal, with a wing incorporating dihedral on the outer panels. Armament was a 20 mm ShVAK cannon firing through the prop with twin 7.62 mm ShKAS machine guns in the fuselage, and a ShVAK cannon in each wing. The first prototype had a slatted wing to improve handling and short‑field performance while the second had a wooden wing without slats, in order to simplify production. While plans were made to put this Yak‑3 into production, the scarcity of aviation aluminum combined with the need to produce a large number of simple fighters quickly in the face of the Nazi invasion led to the first Yak‑3 being abandoned in late 1941. The Yak‑1M that appeared in 1943 was a smaller and lighter version of the Yak‑1. One Yak‑1M prototype was constructed later that year that incorporated plywood instead of fabric covering the rear fuselage, a mastless radio antenna, reflector gunsight and improved armor and engine cooling and a Klimov VK-107 engine. Chief test pilot Petr Mikhailovich Stefanovskiy was so impressed he recommended the new aircraft should completely replace the Yak‑1 and Yak‑7 with only the Yak‑9 remaining in production. The new fighter, designated quickly; by mid‑1946, 4,848 had come off the production lines. The Yak-3 was lighter and smaller than the Yak‑9, while powered by the same engine. In service, it was found to be a forgiving, easy‑to‑handle aircraft loved by both rookie and veteran pilots and ground crew as well. It was robust and easy to maintain in primitive conditions. The Yak-3 reached operational units during the summer of 1944, with service tests conducted by 91st IAP of the 2nd Air Army in June‑July 1944. In one large battle on June 16, 1944, 18 Yak‑3s fought 24 German aircraft, shooting down 15 for the loss of one Yak destroyed and one damaged. By the next day, Luftwaffe activity over that area of the front virtually ceased. That day, eight Yaks attacked a formation of 60 German Ju-87s and Bf-109Gs. In the battle, the Germans lost 3 Ju-87s and four Bf-109Gs for no Soviet losses. After this, the Luftwaffe issued an order to "avoid combat with Yak fighters without an oil cooler under the nose below 5000 meters". In late 1944, the Normandie‑Niemen Group re‑equipped with the Yak‑3, scoring the last 99 of their 273 air victories with the aircraft, which they later took with them to France where they were used for a short time in 1946. The Yak-3 was far from perfect. Wartime production quality problems included plywood surfaces coming unstuck when pulling out of a high‑speed dive, along with poor engine reliability and problems with the pneumatic system actuating landing gear, flaps and brakes, which was typical for all Yak fighters of the time. 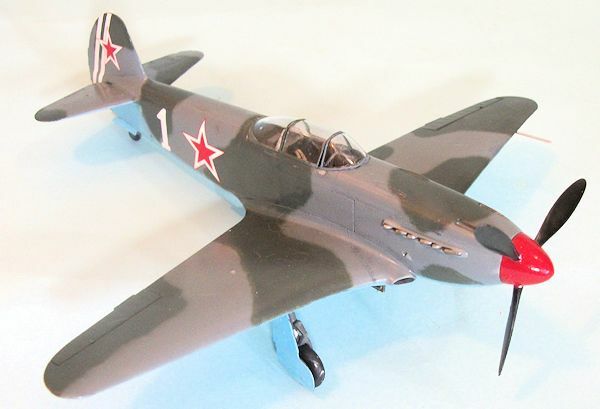 This Yak-3 is the third Soviet World War II fighter released by Zvezda in 1/48. Like the La-5 and La- 5FN kits, it is the best representation of the real thing available in any scale, with an overall fineness of design that represents the real airplane far better than the now-elderly Eduard kit, the only other good kit of the Yak-3. The kit provides the option of assembly with the cowling off, providing a fully-detailed engine and accessory and armament section within a well-designed airframe. This is presented as a “power egg” to be attached to the rest of the model after final assembly and painting. Alternatively, the model can be assembled with the cowling closed up, preserving the fine lines of the original. The usual flat-finish Zvezda decals are provided for three aircraft, including “White 9" flown by top-scoring French ace Marcel Albert. Overall, a Zvezda kit is more of a well-designed limited-run kit with pretensions to a mainstream injection kit. One needs to watch for flash, and to test-fit parts before committing glue. That said, the model is well-designed, and everything goes together very nicely if this care is taken. I did not use any putty or surfacer on this model, other than to run a line of CA glue down the centerline seam of the fuselage aft of the cockpit. The instructions are logical in their sequences and easy to follow. I first painted the interior parts, following the kit instructions to do so with dark grey. I am always puzzled by exactly what color Soviet cockpits were then. Looking at the Yak-3U we have out at Chino, it is painted this way; I am not sure if Zvezda based their instructions on wartime information or on these new-production Yaks. I decided that I would do the model with the cowling closed up. Rather than assemble the cowling separately and then attach it to the assembled model, I attached the lower side parts to the individual fuselage halves before proceeding with further assembly, to be sure of good fit. That was my only departure from the instruction sequence. I replaced the kit decals for the instrument panel with individual instrument decals from an Air Scale sheet. I also used an Eduard photoetch seatbelt set for Spitfires, since the Soviets also used the Sutton harness. I mixed what looks like “Russian light blue” to me with Xtracrylix RAF Azure Blue and white and applied that. The upper camouflage was done with Xtracrylix RAF Ocean Grey and RLM 74 Grungrau. I then applied a coat of Xtracrylix clear gloss varnish. The kit decals probably work, but I decided to use the decals for a Yak-3 flown by Major Nikolai Fedorovich Denchik, Commander of the 4th GIAD of the 1st Baltic Front in the winter of 1944, as presented on Aeromaster’s sheet of Yak fighters, “The Russians Are Here! Part II”. These went down without problem, and I then applied a coat of Xtracrylix Satin varnish overall. The landing gear legs are designed so they cannot be attached incorrectly as regards their proper angle. I wish more companies would do this, since there is nothing more likely to make a modeler look stupid with their final result than to get the sit of the model wrong due to incorrect alignment of the gear legs. I decided to close the canopy since the clear parts are very thin and clear, and this preserved the overall lines of this trim airplane. This kit, unlike the clunky Eduard kit, results in a model that preserves the look of petite daintiness found with the original. 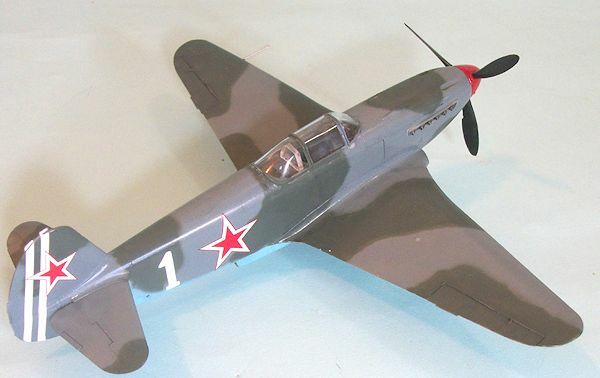 I think this is the best kit of the Yak-3 available in any scale, and I hope Zvezda will proceed to do the rest of this famous series of fighters in this definitive manner. Highly recommended. Review kit courtesy of HobbyLink Japan. Get yours at the link.